Hey blogland! Hope your all well!! 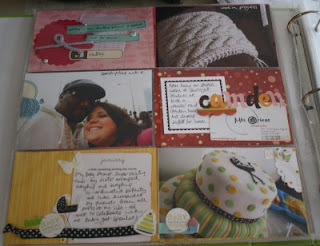 Well I finished my document 2010 layouts - and I'm really pleased with them! Hopefully it will be something I can continue throughout the year!! First page with my envelope of 'stuff' including a receipt from shopping, my baby shower invites, leaving card from work, tag from my baby changing bag (kipling from my mum yay!) plus a selection of other photos not used. Then the divided pages using up some pictures showing my leaving balloons, the TV guide where we have discovered and loving glee, pic from a day out and a business card from the restaurant, pic of the scarf I'm knitting (slowly!) and some of the wool used and some bits and pieces from by baby shower. Last page - focus for this month Waiting for Baby. We did a lot in Jan in preparation - me leaving work, sorting out baby's room, buying the buggy and car seat, packing my hospital bag, having a baby shower, washing the bedding and clothes and attending antenatal classes. Our own little musings - i loves it alot!! Please check out her blog or become a fan on facebook for more info!! Apart from these layouts I haven't been very motivated to do anything!! I have however baked a couple of cakes and read a book in 24 hours but not done anything creative. I think about it and then that's about it!! Not great! 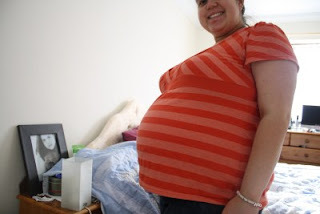 So this is me at 39+6days pregnant. Tomorrow is my due date and no baby as yet! I shall keep you posted. Enjoy your Wednesday! Love this blog post! Your document pages are so awesome!!! 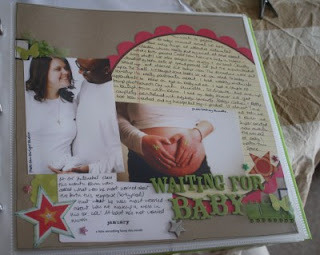 Especially your "waiting for baby" page, I think it's my favourite ever layout of yours! Love your Document 2010 pages, it'll be so great for you little one to see what you were up to in the las few days before they were born. Hopefully next time you'll have some baby pictures to post? V. exciting! 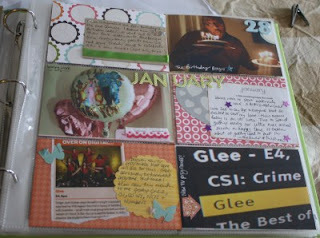 Love the pages, I can't believe how quickly my January has become a blur! I ate some spicy chilli to kick start my labour! Make sure you post some baby pics as we'll all be waiting to see your little one! Well hopefully as I am late in reading this baby will be here and you both will be safe and well. 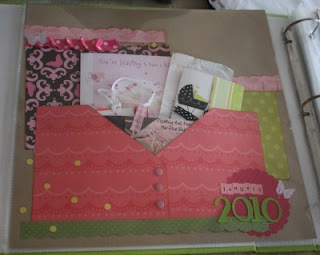 Document 2010 is really suiting you girl, the layouts are just gorgeous and I love the huge bump photo and that photo of you on the bedside, you look stunning! love the pages and work you've done! Your pages is wonderful! Love the last page, the summary page! The gift is fab as well, very good. 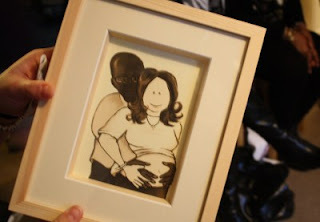 What a great keepsake for you & baby!